Didier Mouturat created in Paris, with Cyrille Dives, the Theater-School of Masks and a theater company, Le Bâton de Folie, both of which became vehicles of radical artistic search. The original French edition appeared in November 2013, under the title Tous les matins, l’énigme … La vie derrière le masque (Éditions Éoliennes, Paris). “You had to decide to let yourself be turned upside down, you had to accept to see the idea you had forged about yourself progressively shatter.” In the summer of 1969, at 19 years old, Didier Mouturat gave up on college, shattering his parents’ hopes that he follow a safe and conventional course. Fresh from the wild Parisian student revolt of 1968, with its street battles and slogans, he set out to find a life that would be truly alive, deciding to be a classical actor. When he met Cyrille Dives, however, the universe of masks quietly turned his world upside down. This book describes Mouturat’s apprenticeship to a unique theater artist. 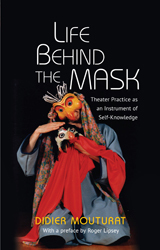 In the 1970s and early ‘80s, Dives created a theater of masks, a Western parallel to Japanese Noh. Dives was a true bohemian artist, a sculptor of masks, a painter and theatrical director. Cyrille Dives was also a spiritual master. Mouturat’s apprenticeship encompassed everything from walking in a way that brings a mask to life to cultivating a beginner’s mind. Slowly and subtly, the theater apprenticeship became an encounter with the deeper truth of his own being. “I am speaking of an intimate, progressive discovery that we are not masters of our own being – that it is only the result of a system of reactions that tyrannize us.” Mouturat becomes Dives’s right-hand man, helping establish a theater and a school of masks. That work is evident here in enchanting illustrations, as well as words. Yet as translated by the scholar and author Roger Lipsey, Mouturat also offers a pithy chronicle of a search for meaning and inner being.